The response of a synthetic element to the appropriate miRNA was measured in HT-1080 or HeLa cells for a number of popular miRNAs. Briefly, 100ng of an individual reporter construct was co-transfected in triplicate with either a microRNA mimic or a non-targeting at a final concentration ranging from 20-50nM. The average luminescence was calculated for mimic replicates and was then divided by the average for non-targeting control replicates. For a particular cell-line, a strongly-repressed human 3′UTR target is displayed alongside the represssion observed for the synthetic target as the log2 ratio of mimic to non-targeting control signal. 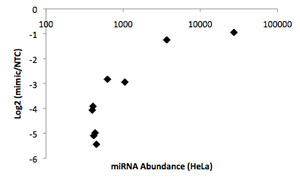 The level of endogenous miRNA in the cell (x-axis) is inversely correlated with knockdown of the synthetic target reporter fusion in the presence of a miRNA mimic. 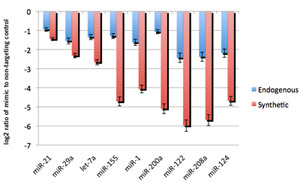 Low knockdown suggests that the cell line expresses high levels of a miRNA, indicating that a miRNA inhibitor may be more effective in that cell line. Here, we compared the level of knockdown observed in HeLa cells for 9 synthetic miRNA target reporters previously tested for microRNA abundance in HeLa as detected by oligonucleotide microarrays (Barad et al. Genome Research 2004 14:2486-2494). The Pearson’s correlation coefficient for these data was R=0.66.